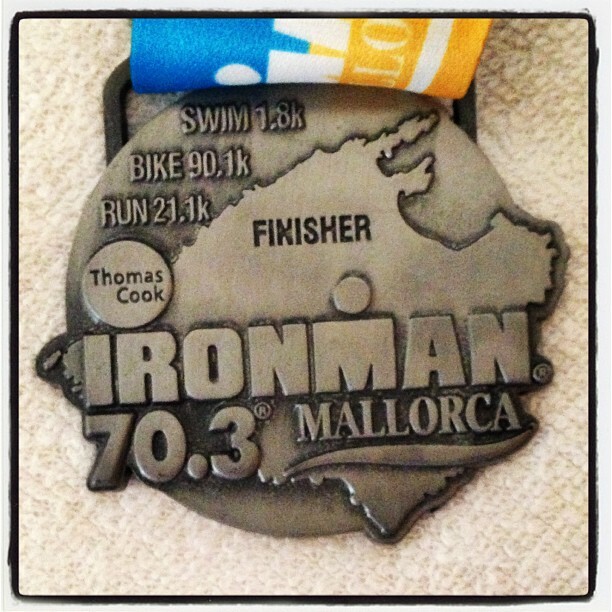 On Saturday 11th May 2013 I competed in my first half ironman. The venue was the port town of Alcudia in Mallorca. A long time ago I had decided to complete this race as a it is a favourite with my old training partners from RG Active. This blogpost will evolve when I get back home and manage to add photos but at the moment I am scribing on my iPad. If you want the short version I competed the event. If you want the long version in blow by blow detail please read on. I arrived in Mallorca on Tuesday and was relieved to get my bike back. I turn into a nervous wreck from the moment I leave my bike in one country until I am reunited with it on the other side. I dread to think what could happen to it in transit. It could get lost or damaged and I would be gutted. 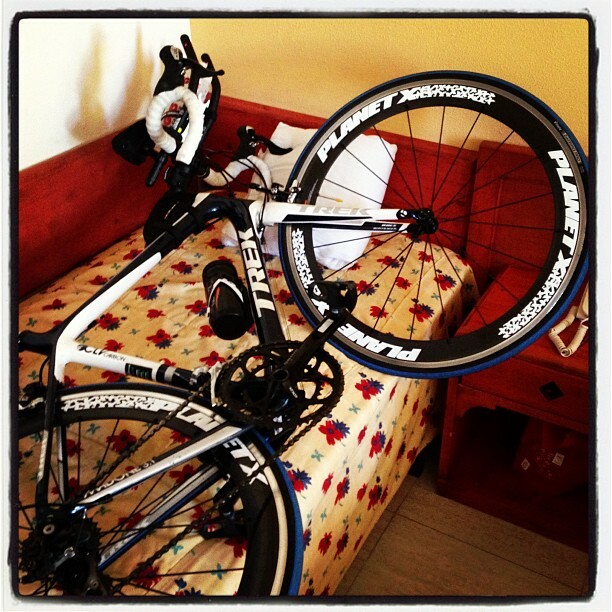 After me and the Mrs had arrived at the hotel I reassembled my bike with no real dramas. I even managed to reconnect the derailleur hanger which I took off for the flight. After my bike was rebuilt and I had unpacked. It was time to explore Alcudia. The transition area was a three minute walk away from the hotel and was already starting to take shape as it was fenced off. One thing struck me immediately. The transition area was huge. The rest of Tuesday was spent chilling out. D. see if my trainer choice was the right one. The regular readers will know I have struggled with finding a suitable pair of trainers that don't cause me to suffer from blisters on runs greater than 4 miles in length. At the last count I am on my 8th pair of trainers since the 1st January. I am currently running in a pair of Pumas. I am struggling to get used to the lack of cushioning but they were the only pair I brought away as to date they haven't caused me to blister. My preferred running trainers do cause me to blister so I left them at home. 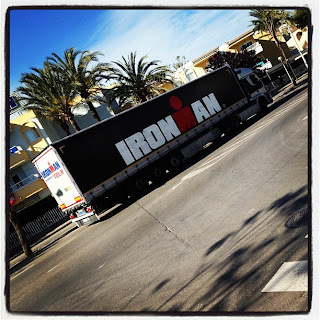 During my run I noticed that the Ironman machine was gaining pace. Since 4pm the day before, buoys had been placed in the sea, bike racks had been built. The event had an autonomy about it as I hadn't seen anyone working and a lot had happened last night. My run was a quick 2 mile jaunt running at 10min/mile pace, I purposely kept the mileage down after receiving some advice from Lucy Gossage. I can live with the pace I managed in the heat but it was only 8am. Towards the end of my run I noticed that familiar feeling in my left arch and knew my trainers were aggravating my foot. NOT AGAIN! When I got back from my run. I spent most of the rest of the day chilling out by the pool. I mostly managed to not burn in the sun which was a result. Unfortunately I burnt through my hair. In the afternoon i played volleyball at the hotel, the staff at this particular hotel put on activities to keep the inmates entertained. My wife was petrified that i would break myself, which is really cute. After the temperatures had dropped I took my bike out for a spin to make sure the gears were working fine. They were thankfully. Thursday marked the day that some of my old training partners would be turning up from RG Active but I had all the morning to do with as I saw fit. I went for another two mile run to see how my hot spot from yesterday was. It starting to rub again. Not good when I had a half marathon to run in 2 days. I got up on Thursday with a scratchy throat. Uhoh a sure fine sign of impending lurgy. Just what you need two days before you push your body further than it has ever gone before. 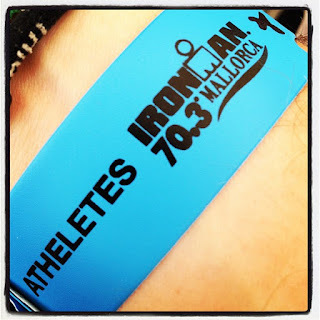 My wife had come down with an illness at the weekend and ended up sleeping on the couch so as not to hamper my chances of completing my half ironman by passing the illness to me. Her illness took three days to fully develop so there was an outside chance I would be fine for the race. 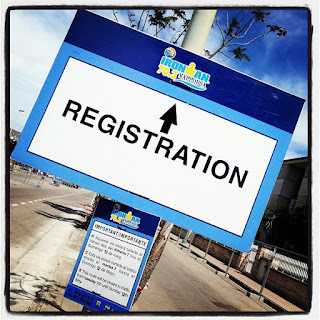 We spent the morning chilling by the pool and made our way down to the registration and ironman expo. I was meant to register with my mates but as there wasn't a queue I took advantage of this. The registration process was flawless. It took all of four minutes and I left with a race pack containing my race number, three transition bags, a chip token, an official programme and a rucksack to keep it all in. At the expo I ended up buying some running socks (to hopefully cure my blister worries on race day) a cap to protect my sunburnt head and a T-shirt containing all the names of the competitors. We than went out for tea with my friends. It was good to catch up with them and meet some new people. Friday lurgy update - throat still scratchy but no worse so race is still on. On the Friday I got up and went for my first sea swim in Alcudia. I had planned to meet my friends at 10am. As I was putting my wetsuit on, disaster struck. It ripped in four places. As this suit was new I was more than a little pissed off about this. The suit cost me a considerable amount of money and it was only my third wear. I will be taking this up with the manufacturers as one of the seams has also started to come apart. Not what you expect for £350. None of the rips went the full way through the neoprene but this is not the point. 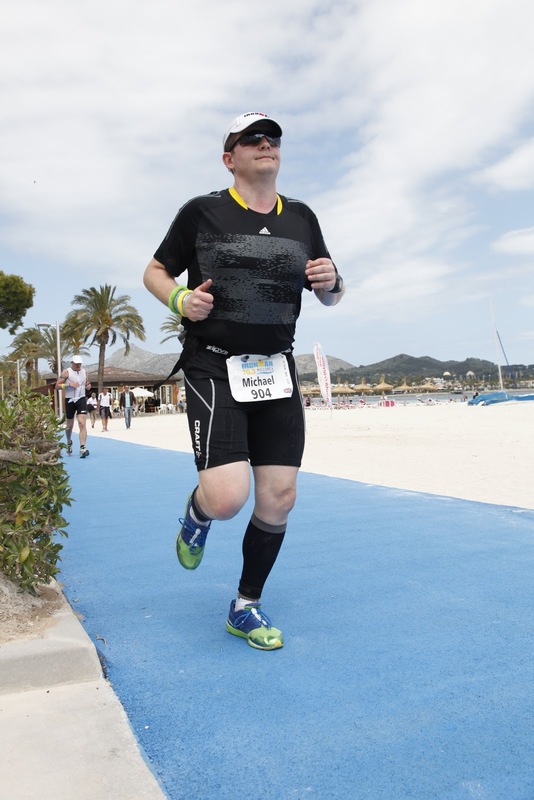 I then jogged through Alcudia in my half on wetsuit and got some weird looks. Honestly is someone running through the streets in a wetsuit such a random sight for a Friday morning? I got to the triathlon expo to get some wetsuit glue. By the time I had repaired the tears I had missed my 10am meeting time so went for a swim alone. I don't mind this as it give me time to think. I set a blistering pace in the 1km that I swam. The fastest I have ever swum. I managed to set a new pb of just over 15 minutes and for the first time felt really good sighting. After the swim I got back to the hotel and started to prepare for the race. 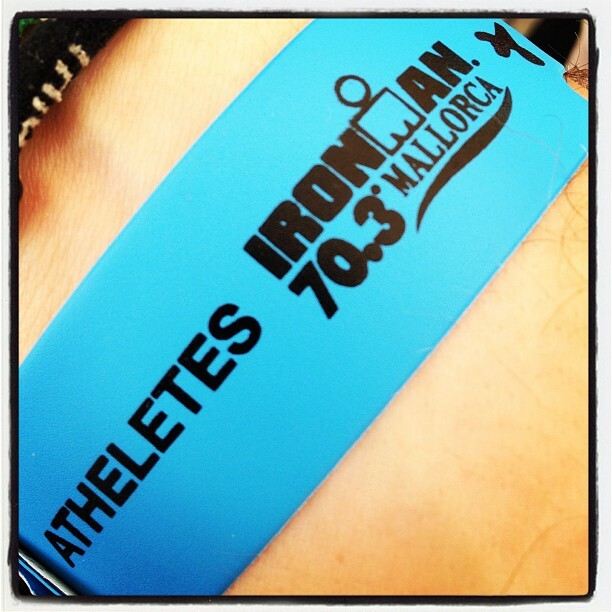 I have never had to rack the day before so it felt weird getting my head into race mode. I had to pack my three transition bags. One for the swim to bike transition, one for the bike to run transition and one for the clothes I would like to wear on completion. 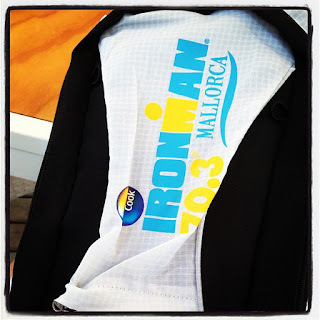 I even had to get out the stuff I planned to wear in the swim to ensure I didn't forget anything. I packed for every weather eventuality except rain. This may not have been my wisest move given my previous rainy experience but it is Mallorca after all. 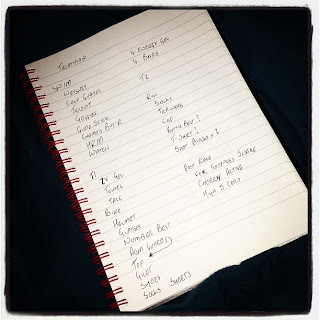 I checked rechecked and checked again what I had packed as I didn't want to forget anything. My Mrs was so patient and even helped check the items in the bags. I then organised my race nutrition for the bike and run. 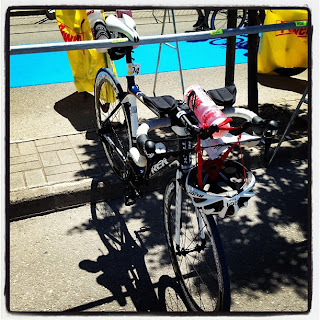 When everything was packed I made my way to transition with my bike and my numerous bags. Racking my bike was a doddle, I let some air out of my tyres to reduce the risk of tyre damage due to heat. I dropped off my bags at the relevant rack and collected my chip. I then made my way to the race briefing. 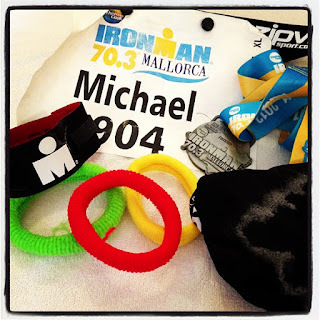 I paid a lot of attention to the race rules as I didn't want a DQ in my first Ironman 70.3 race. After the race briefing it was time to relax. I carb loaded like a machine on Friday afternoon and evening. 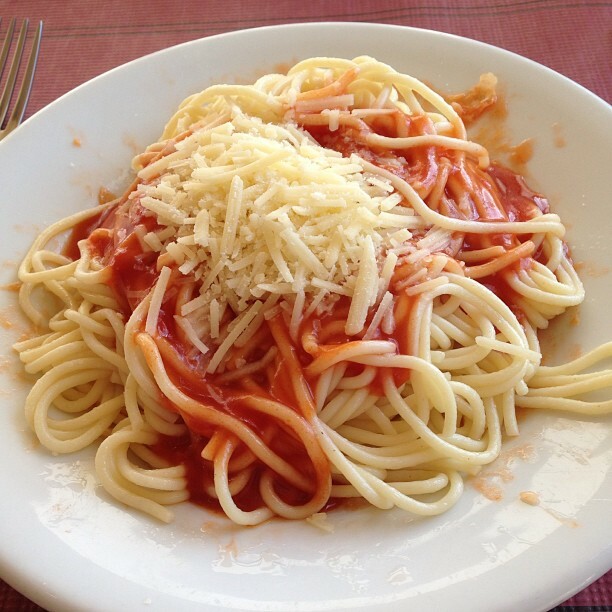 I can't remember the last time I consumed so much pasta. Fast forward a few hours and bedtime ensued. Could I sleep? Could I balls. A combination of pre race nerves and a noisy bar next to the hotel meant I must have only managed 4 hours of sleep. Not the best prep for any race let alone a half ironman. Lurgy update - nothing to report I'm still racing. Now for the interesting bit about this post. I woke up and felt lethargic. I had to force down two slices of toast. I only perked when I had consumed my pre race caffeinated drink. I got dressed and made my way to transition. After pumping up my bike tyres and three pee breaks. I was time to get changed into my wetsuit. Cue another two tears. Harrumph. After I had half put on my wetsuit I made my way down to the beach and managed to catch the pro start at 8am. I then said my goodbyes to the Mrs and got her to zip up my wetsuit. Given swimming is my strength I manoeuvred my way to a good position for the swim start. Near the front. I then went through my pre race checks to make sure I have remembered everything. Wetsuit check, swim hat check, goggles check, dropped wedding ring off with Mrs. Oh chuff. I had forgotten to do this. I never swim in open water in my wedding ring for fear of losing it. I then exited the start area and frantically searched for my wife. I couldn't see her anywhere. What to do? What to do? C. put wedding ring on middle finger and worry about getting it off later. I decided C was the best option and had just managed to put it on my middle finger when I spotted my wife. After a minute of trying to remove my ring it came off. I handed this to my wife with a minute to spare before the race start. I had lost my good position for the race start but had ensured I wouldn't lose my wedding ring. A small price to pay. The gun went off and I jogged down to the water. I waded up to above my knees and then dived into the water. Given my start was now near the back I had a lot of work to do to get clear water. I started out on the extreme left but swam over to the right as there was more space there. After 400m of stop start swimming while I was in the washing machine I broke free and found clear water. Now my race could start. There was a swimmer of similar speed swimming alongside me who could not swim straight. I found this frustrating but could not drop him. I reached the turn and overtook him but couldn't stay ahead of him and he then proceeded to cut me up a lot on the way back in. 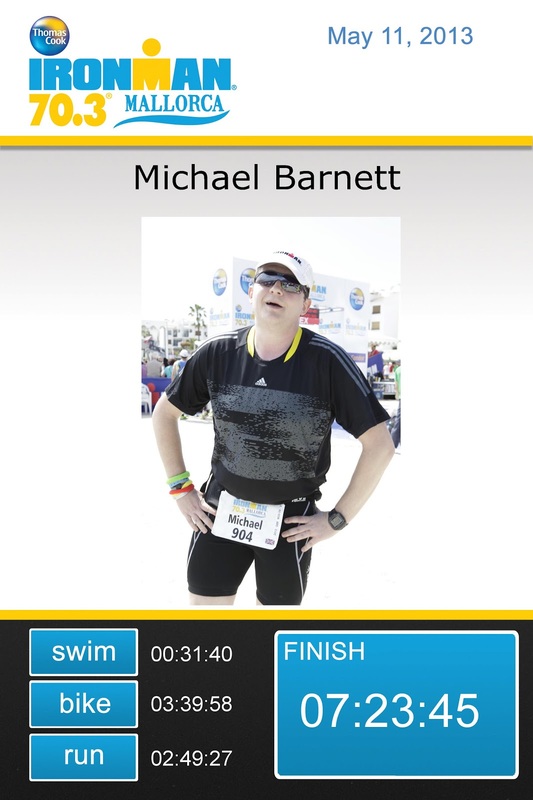 I exited the water in 31 minutes and change and had my wetsuit around my waist before I had left the water. 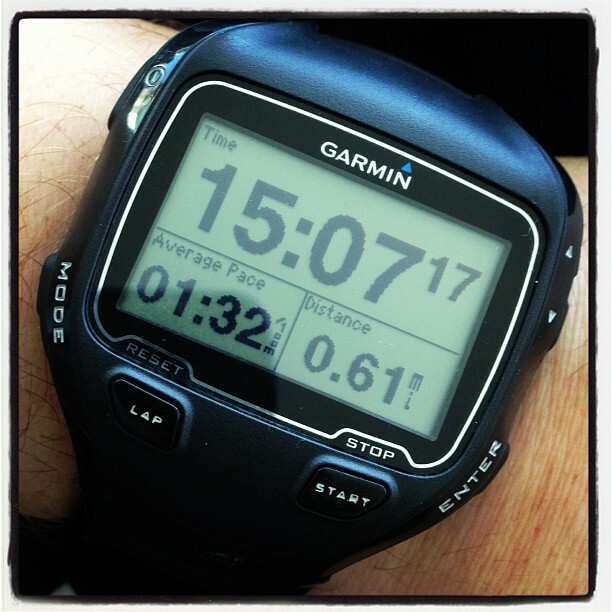 This is the fastest I have ever swum this distance in. I'll take that given the difficulties I had in breaking free. 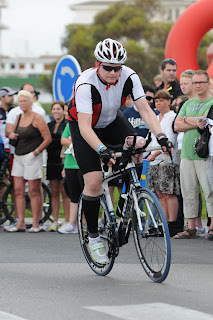 In my next triathlon I intend on starting at the front. I'll freely admit to walking up the beach, not through tiredness but I always suffer from dizziness post swim and didn't want to turn an ankle on the sand. 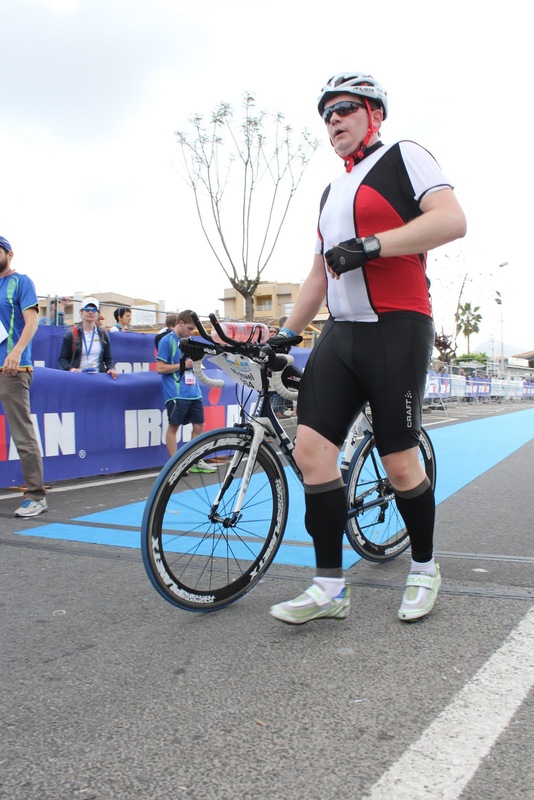 I made my way into T1 and took off my wetsuit hat and goggles, I then towelled off my feet before applying socks, I put on my extra shorts and my shoes and my cycling top. I then applied suncream to everywhere that was left exposed (or so I thought. I forgot the area of leg between calf guard and shorts) I put all my swim stuff in my bag and dropped this off with staff and jogged to my bike. I picked up my sunnies and put them on then it on my helmet before I touched my bike. No DQ for me. I then took my bike to the mount line. Oh crap I'd forgotten to put the number belt on. It was still on my hoods. In my haste to not block the exit I pulled my number belt apart and then spent three minutes repairing it. Sometime I am so clumsy. I finally managed to start pedalling. I was lucky enough to have ridden the bike course in March so knew mostly what to expect. A coast side ride to Pollença, a slight incline to Lluc, a neverending relenting climb of 11km where you gain 850 vertical metres then a technical downhill and then pancake flat to Alcudia. Okay so I've made that sound easier than it was but I was prepared. The ride to Pollença flew past. I even overtook some people. What was I doing? I don't overtake people on the bike. The weather for the climb out of Pollença was good and the slight ascent passed without incident if you overlook the fact I got overtaken loads by people on TT bikes. After you reach have climbed out of Pollença, you start the 11km climb to Lluc. I had ridden this in March without stopping and was determined to do the same this time round. I remembered a lot about this climb including where all the false summits where. There were three of these which in March had lured me into a false sense of accomplishment. You wouldn't catch me out this time. 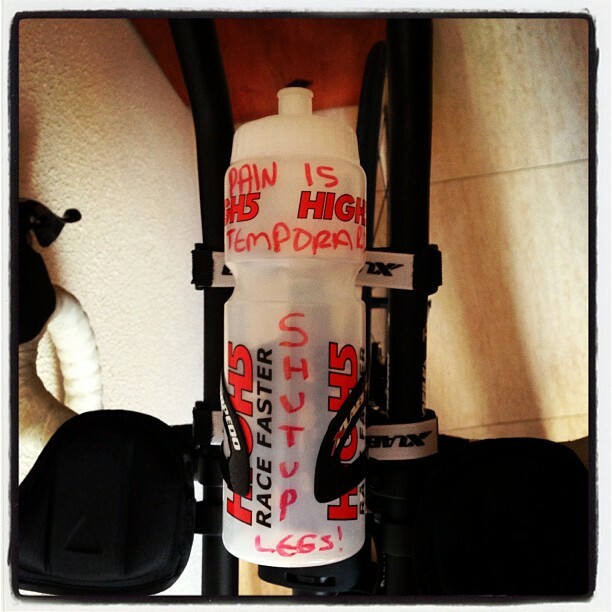 I had written the following mantras on my bike bottle for this climb to spur me on. "SHUT UP LEGS" and "PAIN IS TEMPORARY". These helped me in the dark moments of the climb. The climb is just a long slog. It is not that steep that it causes any real issues but it is just relentless. After about 3km I noticed a rider at the side of the road (Tracey was her name. Isn't it amazing the details you remember while racing). I shouted encouragement to her and in doing set myself a precedent. I would endeavour to spur on or talk to every rider I passed. Being nice doesn't cost anything and hopefully the riders found it nice. When I reached the top I was relieved as I had completed the hardest part of the bike ride and knew barring any technical difficulties I would make it to the run. I started the technical descent towards Caimari. Again I had completed this in March so knew when to expect. It is very twisty on the way down with multiple hairpins. After I had completed approximately 2/3 of the descent and was approaching a hairpin I was aware of a rider on my shoulder. I couldn't take the line I wanted to because of him. I was running wide and heading for the outside edge of the hairpin. To make matters worse my back wheel locked up. Cue fish tailing at 40km/h. Not my finest moment. I managed to regain control of my bike and just in time. This could have ended very differently with an unknown drop on the otherside of the protective stones. I took the rest of the descent very cautiously as the adrenaline coursed through my veins. After I reached the Caimari I knew the descent was complete so it was back to pedalling. The next 42km flew by without a problem. I set an average speed of over 30km/h for this section which included the descent but still this is the quickest speed I have managed to maintain for long. My nutrition strategy must have been working. A gel every 30 mins and an energy bar every hour. It's good that I have perfected this. 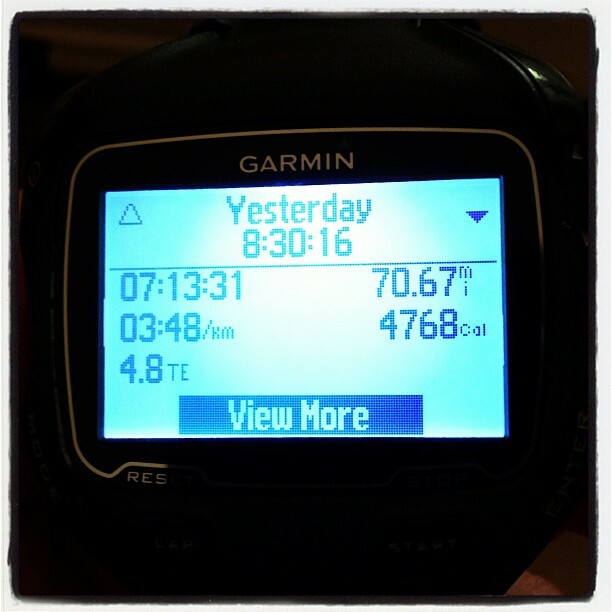 There was a kick in the nuts at about 65km in the shape of a steep ascent which I had not envisaged. It was very short but very steep and caught several riders out as it was after a 90 degree bend. I made my way to transition without any further incident and completed the 90km in a time of 03:39 which was inside the four hours that I thought it would take me. Get in. During the bike ride I realised something. I have been debating buying a TT bike next year providing I still get enjoyment from triathlon but on this bike ride whilst watching riders who overtook me I realised that I do not have the power or cadence to make such a costly expenditure worthwhile, I will not be able to reap the benefits. I will persevere with my current bike and if my power improves will reconsider but for now I need to learn to get the most out of my Trek Madone. If anyone feels like donating me a TT bike I wouldn't say no but I need to improve my riding as a whole before spending money on a new bike. I think I need to spend time in the gym. I will apologise in advance for the next few paragraphs which are a bit of a rant. At the race briefing on Friday there were lots of rules but some in particular stood out to me. 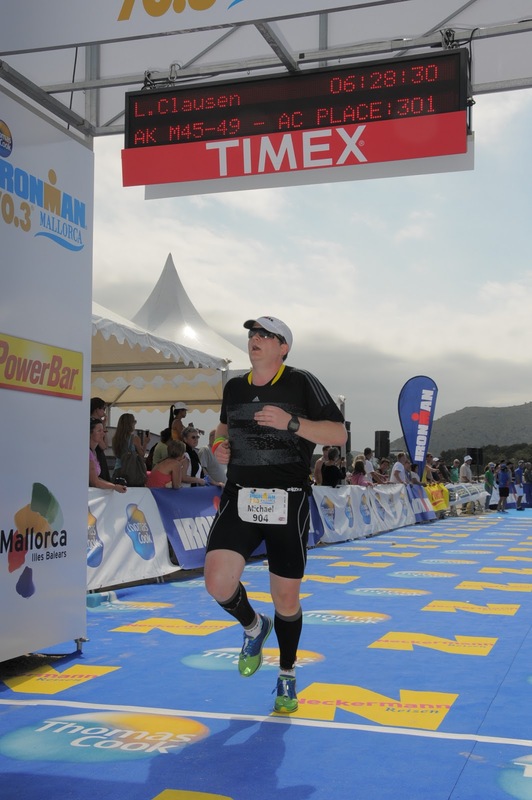 I consider myself to be an honest person and Did not want a DQ in my first half ironman. The two rules which stuck out to me were. 1. No drafting. You must maintain a 10m long gap between you and the bike in front. 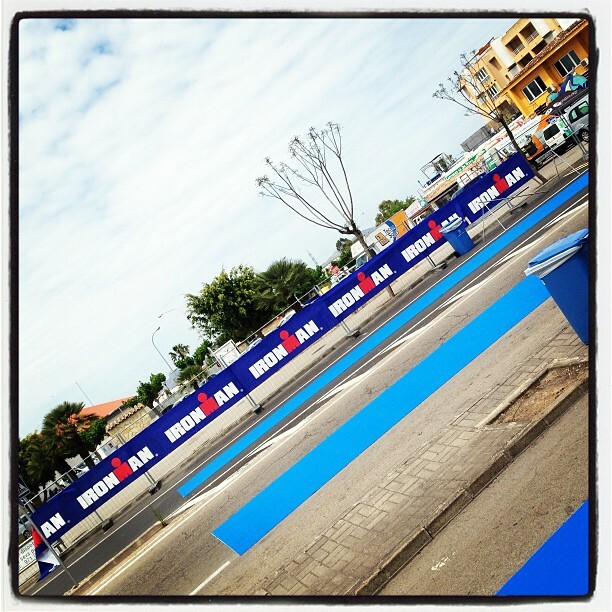 If you move into this gap you have 30 seconds to overtake the rider in front. This seemed quite simple to me I obeyed this rule throughout my 90km ride. If someone of similar pace overtook me I either braked or stopped pedalling to get this 10m gap back as quickly as possible. I think some of the other riders got confused between this which is a non drafting WTC race and the ITU races which are draft legal as on several occasions I got passed by packs of up to 20 riders. I say packs as they were hunting down slower riders. As you are all aware I do 95% of my training alone so am used to having to slog it out in headwinds but I do know the benefits of peloton riding. If you can stay in a peloton every rider except the lead rider will burn around 20% less energy as they are in a slip stream. This really annoyed me as I pedalled my way through the bike course honestly and yet there were some rider who blatantly cheated. In my opinion I earnt my finishers medal and can sleep soundly. They didn't earn their medal as they were dishonest and should have difficulty looking at themselves in the mirror unless they take intravenous horlicks to be able to sleep. I hoped that the mobile marshals would catch these cheats out but I doubt if they did. 2. No littering at any point. I knew this was expected so took it upon myself to construct something which mean I wouldn't be able to littler. This item worked a dream and I didn't litter once. I understand accidents happen but I witnessed people blatantly littering without a care in the World for the consequences. This rule if broken and caught resulted in instant DQ and rightly so as litter on the road is dangerous as it could lead to a puncture or loss of traction. Thankfully I escaped unscathed from this blight but out of 3200 riders I doubt all were as lucky. 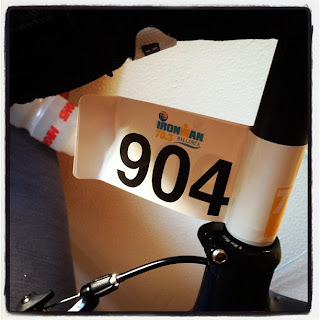 Wthi the amount of detritus I witnessed on the road I was ashamed to call myself a triathlete. 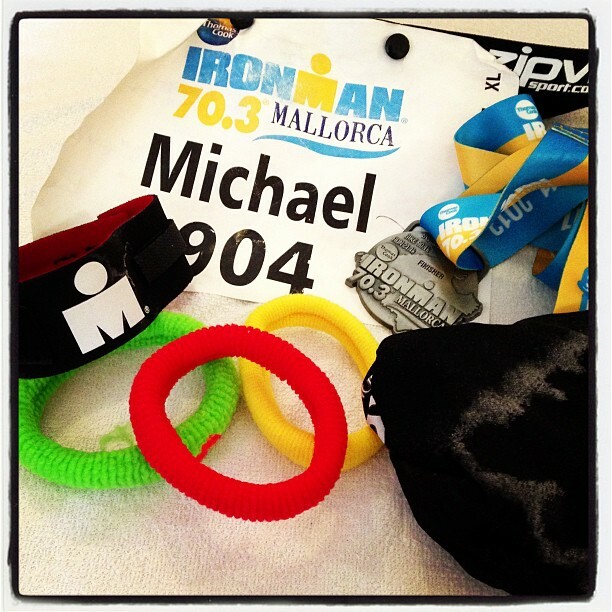 Mallorca is a beautiful place and does not need 3200 triathletes polluting it. I made my way to the dismount line with my feet outside of my shoes and jogged to my racking point. I droopedd off my bike and jogged to the bag rack and change tent. Cue more suncream and a change of clothes and once my bottle belt had been fastened around my waist I was on my way. I set off again and was going well for another 0.5 miles when all of a sudden all I saw was sky. Yes again I had managed to turn my ankle and perform a ninja roll. The person I had been talking to stopped to make sure I was ok. While I was on my back facing the wrong way I got cramp in both my hamstrings. Oh great. There was no way I was going to be moving quickly. I told the other racer to continue. After about a minute of stretching I gingerly set off run walking but my momentum had gone. The wind had left my sails. I wanted the ground to open up and this sufferfest to be over. I had 10.5 miles to go to complete. Time to dig in and use that "I CAN" attitude. 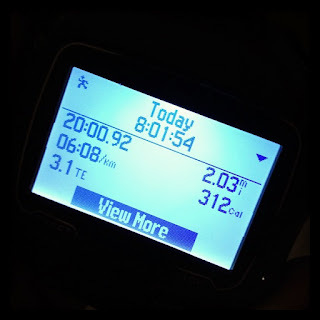 The rest of the run was not pleasant and consisted of more walking than running. At the end of each lap you get an armband. These were so momentous on my journey. They represent 4.4 miles less to travel and 4.4 miles further into the hurt locker. They were bitter sweet and I couldn't wait to get the next one. I was not in a very positive place until nearly 9 miles. I had not seen my friends or Mrs and needed some moral support. My wife appeared like a mirage just before I collected my second armband. I stopped and got told off for stopping by her. There was a fresh breeze in my sails again. It is amazing how uplifting loved ones can be when you have put your body through this. I rulked (run walked) on and had rulked another 5km before I had my next blip. I was approaching 11 miles of the run and had succeeded in pushing my body further into the physical and mental hurt locker than I would have previously thought possible before I started this journey. It was around this point with about 2 miles to go. I thought about how proud my mum would be by all I have achieved on this journey and this made me emotional. For those new to this blog I'll do a quick recap. 14 months ago I was a chain smoking couch potato. 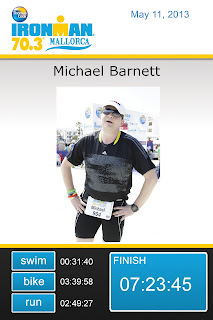 Now I was on the verge of completing my fourth triathlon and had pushed myself through nearly 70 miles to get to this point. in the course of this quest I heave changed my life since stopping sucking on those cancer sticks, I've raised over a £1000 for charity and lost over a stone when most people gain weight on stopping smoking. I summary I rock and it all got to me. Time to man up and finish this job. There was less than two miles to go and in about a mile if the Mrs had stayed still I would see her again. I rulked on and collected my third precious armband after saying to the wife I'd see her soon. There was less than a mile to go. I rulked to within 200m of the line and with crowd willing me on I set off at a canter. I was not walking anymore. When I rounded the last corner I set off at an all out sprint. Here's a tip. Always leave some energy in the tank for the finish as that's what people remember and photograph. The commentator even commented how mich my pace had quickened after I passed under Powerhorse arch. This was it. This was my moment. There was no one around me. I could bask in this moment as I powered across the line. I crossed the line 07:23:45 after starting. I was thrilled with this time after my fall and cramp. The irony is that 07:23 if it were a date would be my birthday. How bizarre is that? Ater I had completed the race I felt overawed by it all. I collected my medal and finishers T-shirt and left the area to meet my wife. After about ten minutes I found her. Cue unconsolable sobbing as soon as we hugged. Like I said I had pushed myself further than I have previously thought possible. Not surprising that I ended up a blubbering wreck. Was it worth this? "HELL YEAH"
I then mozied back to the hotel and had a bath. How rock'n'roll am I? 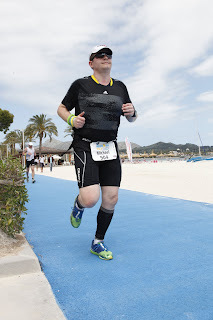 I really enjoyed the race on the whole and if I overlook the slight administrative issues such as a fault on the finishers medal (it was a 1.9km swim not 1.8km swim) and the fact they didn't have enough T-shirts left in the the size I'd ordered (but this was ok as id lost weight). It was really wel organised. If I was asked would I complete the race again. You bet I would. 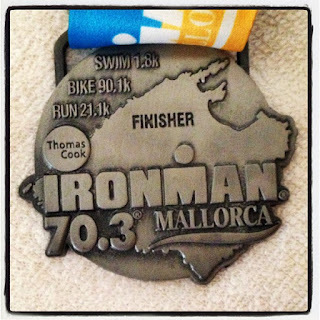 This half ironman holds a special place for me, the same way as people's first car or love mean something to them. My first half ironman is special to me and I will be back at some point. After all I have a PB to beat now. I was thrilled that Lucy Gossage finished this race as the third best female. Lucy is an inspiration and has joined Non Stanford as someone who is a LEGEND in my eyes. She has taken time out of her busy life to not only read my blog but also interact with me. This helps spur me on. Thanks Lucy and many congratulations. Aside from the usual aches I have no new injury concerns and if I was forced to I could complete the race again albeit at a more relaxed pace. As this was a training race this is a good thing. After I got hold of my phone back at the hotel I realised how humbling this quest is when I saw how much support I had received. People were checking the Internet to see how I was getting on. People were congratulating me on my efforts and this paragraph goes out to everyone on Twitter (some I have met, some I haven't) and Facebook who have encouraged me and spurred me on. Thank you from the bottom of my heart. I leant a lot from this race and continue to learn on my journey. LIke it. I too got a bit emotional with myself as I neared finish of PowermanUK last year...weird feeling but you just have to roll with it I guess. Well done and best of luck racing this year.